Have you ever just craved some quiet alone time? I have had two clients last week who brought up the issue of needing some more space and time to themselves. The hectic pace of their lives and the sheer volume of interactions with people in their own home were becoming an irritation instead of a joy. This brought up the discussion of the effect on not getting quiet time as an adult. This I understand. 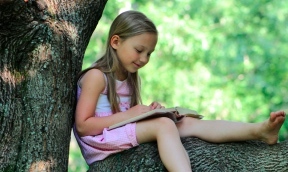 I was the kid who climbed up into a tree to read- so no one would bother or interrupt me. My mom understood this need for quiet time- because she pretended not to notice where I was- even with all three of the family dogs sat patiently under the tree waiting for me. Now I understand the term introvert and how well that fits me. According to Susan Cain one our of every two or three people out of the population are considered introverts. Cain has a TED talk and a book-Quiet- on The Power of Introverts. Yet how many quiet spaces are there in your work environment? Most of our work spaces are designed for interaction and extroverts. In a busy household with different schedules and tasks that need doing- where is the quiet conversation? If solitude is part of what matters to you- then finding the time to be quiet is important to your ability to cope with the rest of the day. What are the benefits of solitude? Solitude allows you to unwind and rest your brain. The absence of stimulation allows your brain to slow down and stop processing information. Solitude gives you time and space to consider your own needs and choices- rather than just going along with the group. It is easier to focus and concentrate on a specific issue or project with no outside distractions. You think more deeply about a topic when you are alone. I consider solitude the antidote to too much outside stimulation. I avoid big box stores partly because of the noise, lights and general level of activity there. Am I a hermit? No. I like social settings with friends where you can talk and interact. I am not as comfortable in a loud, crowded environment where you have to talk over loud music. Solitude for me is a choice that allows be to replenish and recharge my brain, my energy and my emotional levels. If a quiet space fits your needs- then make choices that give you that space to recharge. I have found the simple solution for me is to drink one cup of tea alone in my office without doing anything else. Just sitting and doing only one thing is enough to provide a calm start to my day. This week – be aware of where you can find moments of solitude and enjoy them for what that quiet moment gives back to you. If you have trouble finding a calm space- contact me for more ideas.